Read our leaflet on how to use Blue Badges in Brighton & Hove (PDF 471KB). You must make sure that your badge and time disc are clearly displayed and that the badge is facing the right way. The front of the badge has the wheelchair symbol on it. You may also park on a single or double yellow line for up to 3 hours as long as there is not a loading restriction (marked by strips on the kerb). You must make sure that the time disc is set to the time that you left the vehicle. If I display my badge, can I park free of charge in a car park? Car parks throughout Brighton & Hove have different policies on disabled parking. To make sure you aren't given a parking ticket you should read the signs carefully when you enter the car park. Where can I not park with a Blue Badge? You cannot park on yellow lines with a loading ban. Loading bans are marked by yellow strips on the kerb. 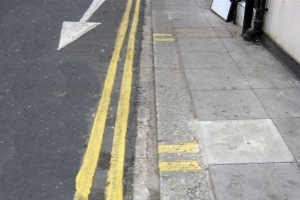 A single yellow line with a loading ban will have a single kerb marking. Double yellow lines will have a double kerb marking. For a single yellow line, a sign on the street will tell you what times the loading ban is in place. school keep clear or zigzags.